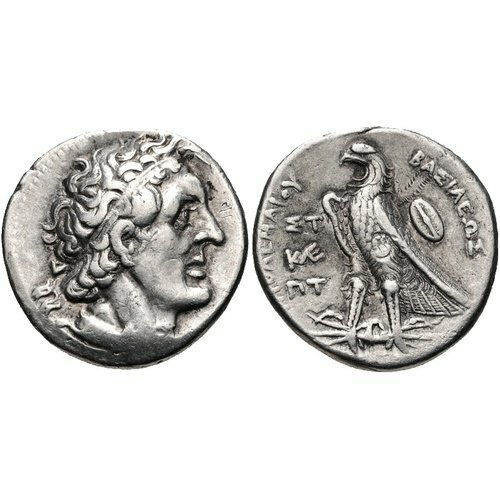 The Ptolemaic kings of Egypt struck many series of coins, mainly in Alexandria but also in various mints scattered in foreign possessions, such as Coele Syria and Cyprus.1 While Ptolemy I seeks to establish himself on the island from 321 BC, the Ptolemaic coin production essentially starts from the definitive annexation of Cyprus to Alexandria in 295/4.2 The creation of a closed monetary economy, at the turn of the 4th and 3rd centuries BC, strongly distinguishes the Ptolemaic coins among other emissions from the Hellenistic East. 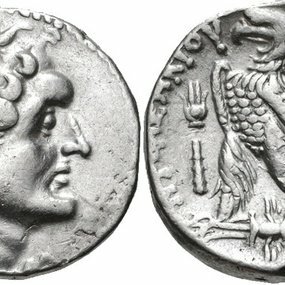 While almost all of the gold and silver coins from this period conform to the Attic standard (drachm = 4.32 g), the Ptolemies adopt a lighter standard (drachm = 3.25 g) and give their money the monopoly of circulation within the borders of the kingdom.3 The obligatory exchange of foreign coins at the gates of the country is generally regarded as one of the main sources of wealth for the Ptolemies throughout their reign. This policy of excluding non-Ptolemaic coins also causes the emission of considerable amounts of gold, silver and bronze coins. In this global context, the Cypriote production represents a rather complex object of study to discuss as a whole. While the identification of monetary series of the 3rd century attributable to Cyprus still provokes debate, the 2nd-century productions, at least for gold and silver, are much better known. At this point, we must add to this chronological dichotomy the difficulties of classifying the Cypriote bronze series, relatively little studied until now. The conclusions of Svoronos were accepted by virtually all the specialists until the publication of the Meydancikkale hoard (CH 10.269, CH 8.308, CH 7.80) in 1989. 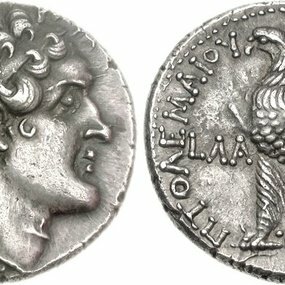 This important discovery of 5,315 silver coins (of which 2,158 are Ptolemaic) brings A. Davesne to pose the question anew of a coin production in Cyprus under Ptolemy II (283-246). Based on the coin finds in different hoards, as well as the location of bronze coins in Cyprus bearing the same control marks, the author proposes that important series traditionally classified as Alexandrian to be assigned to Cyprus.7 He separates these series into three groups which he attributed to the mints of Salamis, Kition and Paphos. Although we should probably retain the hypothesis of a multiplicity of workshops, their precise location seems difficult to validate because of the absence of clear marks. Thus, despite the problems posed by this important study (including surveys by F. de Callataÿ),8 the reallocation to Cyprus of vast series of coins from the 3rd century is perfectly convincing. Gold. Uncert. mint 9, on Cyprus (Salamis or Kition), from 294 B.C. : Sv. 362a, 357, 374. Uncert. mint 10, on Cyprus (Salamis or Kition), from 294: Sv. 367, 365a. Silver. Uncert. mint 9, on Cyprus (Salamis or Kition), from 294 B.C. : not in Sv. (=Meydancikkale hoard, 4744), Sv. 359, 361, 354, 362, 358, 355, 375, 376, 353. Uncert. mint 10, on Cyprus (Salamis or Kition), from 294: Sv. 245, 246, not in Sv. (=Colosseum Coin Exchange 101, 19 May 1998, 101), not in Sv. (=Robinson 1950, Megalopolis hoard (IGCH 180), No 35, 38), Sv. 368, 369, 378, 366. Gold. Uncert. mint 10, on Cyprus (Salamis or Kition), c. 275/4-262/1: Sv. 537. Salamis, c. 261/0-253/2 B.C. : not in Sv. (=Troxell 1983, p. 63, 9), not in Sv. (=Troxell 1983, p. 63, 10), not in Sv. (=Troxell 1983, p. 63, 11). c. 253/2-246 B.C. or later (to 241 B.C. ): Sv. 521, not in Sv. (=Troxell 1983, p. 63, 13). Kition, c. 261/0-253/2 B.C. : Sv. 522. c. 253/2-246 B.C. or later (to 241 B.C. ): Sv. 523, not in Sv. (=Sotheby’s, 21-22 June 1990, 636), not in Sv. (=Troxell 1983, p. 63, 6). Paphos, c. 261/0-253/2 B.C. : Sv. 520a, not in Sv. (=Troxell 1983, p. 63, 8). c. 253/2-246 B.C. : Sv. 520, not in Sv. (CNG 86, 390). Uncert. mint 21, perhaps on Cyprus, before latter 260s B.C. : Sv. 370. Silver. Uncert. mint 9, on Cyprus, before c. 275 B.C. : Sv. 349, 365, 764. c. 275/4-262/1: 528, 527, 530, 525, not in Sv. (=Keen forth., Iraq el-Amir hoard (CH 10.268, CH 9.497), No 66), Sv. 529, 526. From 261/0: 396, not in Sv. (=BnF, 1994.170), Sv. 395, 392, 397, not in Sv. (=Colosseum Coin Exchange 99, 3 Feb. 1998, 101), Sv. 398, 407, 391, 404, not in Sv. (=Ponterio 70, 13 July 1994, 363), not in Sv. (=BnF, Dattari coll., Z.2884,88), Sv. 393, not in Sv. (=Ponterio 70, 13 July 1994, 364). Uncert. mint 10, on Cyprus (Salamis or Citium), c. 275/4-262/1: 538, 536, 546, 544, 542, 542a, not in Sv. (=BnF, Dattari coll., Z.2884,134), Sv. 364, Sv. 364 var. (= Cederlind 178, 76), 539, 540, 541, 543, 545, not in Sv. (=BnF, Dattari coll., Z.2884,142), not in Sv. (=BnF, Dattari coll., Z.2884,132), not in Sv. (=ANS 1944.100.75896), not in Sv. (=ANS 1944.100.75895, BnF, Dattari coll., Z.2884,136). From 261/0 B.C. : Sv. 402, not in Sv. (=ANS 1944.100.75912, BnF, Dattari coll., Z.2884,96), not in Sv. (=commerce 1994), Sv. 541a, 401, 405-406, 399, 400, not in Sv. (=BnF, Dattari coll., Z.2884,94), Sv. 402a, not in Sv. (=Meadows forth., Syria 1981 hoard, 354). Uncert. Mint 19, on Cyprus (perhaps Paphos), from c. 275 B.C. : Sv. 531, not in Sv. (=CNG e-Auctio 256, 154), Sv. 532, 533, 534, 535, 524. c. 261/0 B.C. and perhaps shortly after: not in Sv. (=Israel Museum, 11146? ), Sv. 388, 390, 389, 403. Uncert. mint 20, on Cyprus, probably shortly before 261/0 B.C. : not in Sv. (=CNG e-Auction 226, 19 October 2011, 200), Sv. 394, not in Sv. 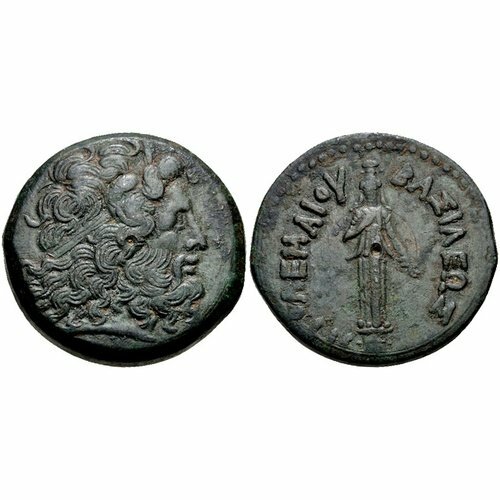 (=Forum Ancient Coins 2008). From 261/0 B.C. : not in Sv. (=BnF, Dattari coll., Z.2884,89), not in Sv. (=Lanz 123, 30 May 2005, 267), not in Sv. (=A.D. Philippidis coll., Hicksville, N.Y., P-2007-12-09.001), not in Sv. (=Seyrig 1950, No 42, Khan el-Abde 1938 hoard (IGCH 1597)). Uncert. mint 21 , perhaps on Cyprus, before latter 260s B.C. : Sv. 371, not in Sv. (=A.D. Philippidis coll., Hicksville, N.Y., P-1999-03-06.001), Sv. 372. Uncert. 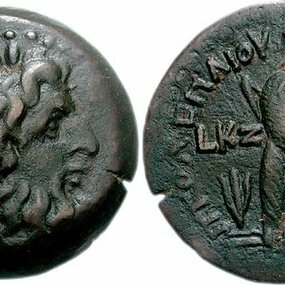 mint 22, perhaps on Cyprus, perhaps Ptolemais (Ake), before latter 260s B.C. : Sv. 373. Table 1: The Coin Production in Cyprus during the 3rd Century according to Lorber, forthcoming. The feature of the Cypriote productions during the 3rd century, as proposed by Lorber, enshrines the idea of a coin production center in addition to the province of Coele Syria. 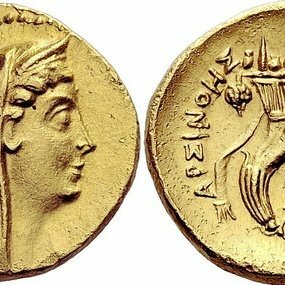 Alongside one-off gold emissions, tetradrachms were struck in large quantities in two and later three mints. 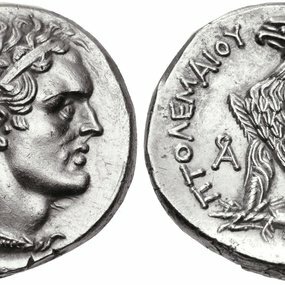 Although the exact timing of strikes is still subject to debate, it seems certain that nearly all, or perhaps all these coins were issued in the first half of the 3rd century,12 as in the other Ptolemaic regions, especially in Phoenicia. Except for the coinage of an "uncertain era," all these series are interrupted between the end of the 2nd century and the first decade of the 1st century BC (89/8). Today, no gold or silver issue is documented for the last fifty years of the Ptolemaic reign over Cyprus. Other elements allow us to suspect a Cypriote origin. 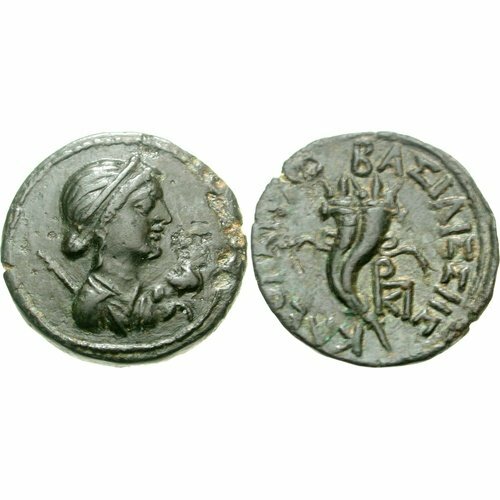 It is primarily the shape of coins: frequently specific enough to recognize a non-Alexandrian production. Style, particularly the portrait of Zeus Amon, is often different from the Egyptian model. 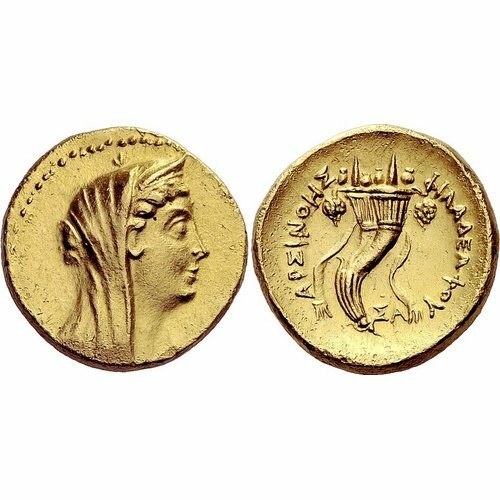 In the 2nd century BC, the presence of different symbols on many varieties of gold and silver has a parallel on some bronze coins. These symbols may appear permanently on a particular series (the lotus flower), or occasionally or even annually as on the tetradrachms. In order to date these coins, modifications of Ptolemaic coins by the Seleucid troops during their brief occupation of the island in 168 BC (countermarks, erased legends) make a solid basis for establishing the chronology of the emissions of this period.46 Moreover, some varieties are also dated according to a regnal era, especially under the reign of Ptolemy VIII [Fig. 11]. The royal coinage ended with the annexation of Cyprus by the Romans in 58 BC. 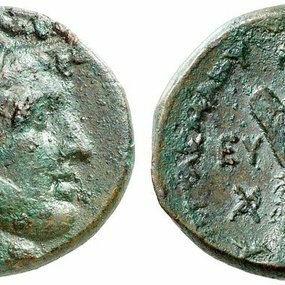 Some bronze coins were again issued by Cleopatra VII when Julius Caesar returned the island to her authority in 48/7.47 These include a particularly spectacular type representing the queen as an Aphrodite holding Caesarion in her arms (the son she had with Caesar) as an Eros [Fig. 12]. Coinages produced in Cyprus under Ptolemaic rule have generated the interest of numerous specialists – archaeologists, numismatists and historians – since the late 19th century. The accumulation of work enables us to outline a fairly coherent picture of all monetary production over this period of time. If the 2nd-century gold and silver productions are better known, further studies should be undertaken about other series. Though our knowledge of Cypriote emissions of the 3rd century has progressed considerably over recent decades, it is still necessary to undertake a study specifically dedicated to this coinage in order to assess its size, organization and functions within the Ptolemaic kingdom. 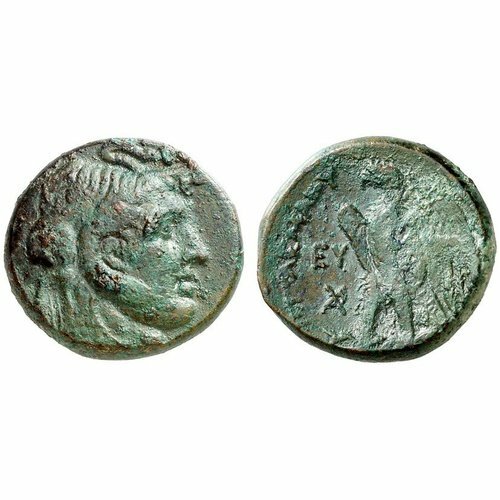 If the indices do not fail to identify the Ptolemaic bronze coins issued in Cyprus, a comprehensive study is nevertheless essential to determine the classifications and specify the chronology. In this light, Daniel Wolf envisages a metrological study of 2nd-century Cypriote bronze coins.48 The recent publication of Alexandrian excavation coins provides a strong base for the study of the bronze emissions from Cyprus. It is precisely in this context that T. Faucher and J. Olivier have recently undertaken a work on these issues for the entire Ptolemaic period. Fig. 1: Mnaieion from Salamis dated to the reign of Ptolemy II. Numismatica Ars Classica 59, 4 April 2001, 658 (27,75 g) Sv. 1323. Fig. 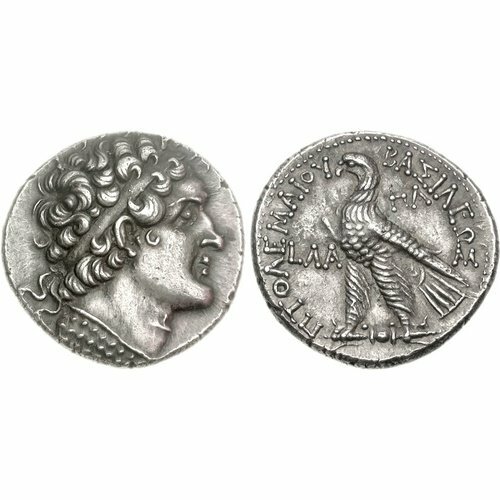 2: Tetradrachm from Cyprus dated to the reign of Ptolemy II. CNG e-Auction 266, 19 October 2011, 199 (14,20 g, 27 mm, 12 h) Sv. 538. Fig. 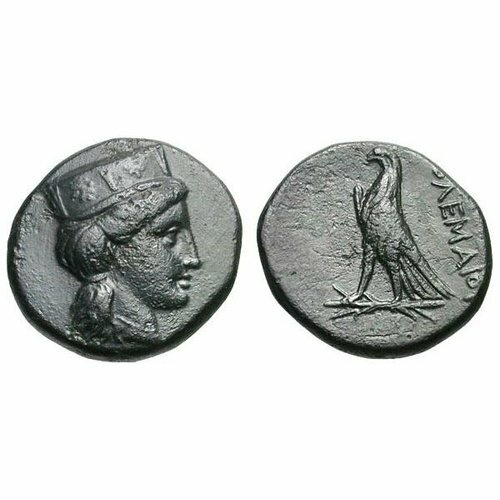 3: Tetradrachm from Kition dated to the 19th year of Ptolemy VI=163/2. CNG e-Auction 254, 20 April 2011, 146 (14,21 g, 25 mm, 45 h). Sv. 1364. Fig. 4: Tetradrachm from Paphos dated from the 31st year of Ptolemy VI=151/0. CNG 81, 20 May 2009, 648 (14,33 g, 12 h). Sv. 1445. Fig. 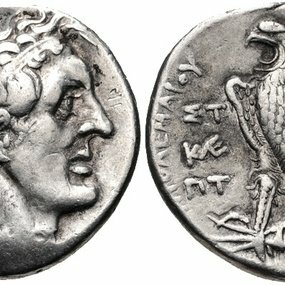 5: Tetradrachm of an Uncertain Era from Cyprus dated from year 91=172/1. CNG 93, 22 May 2013, 624 (13,91 g, 26 mm, 12 h). Sv. 1207. Fig. 6: Didrachm of the type of Dionysos from Cyprus, circa 112-110 BC. CNG 76, 12 December 2007, 917 (6,86 g, 12 h). Sv. 1802. Fig. 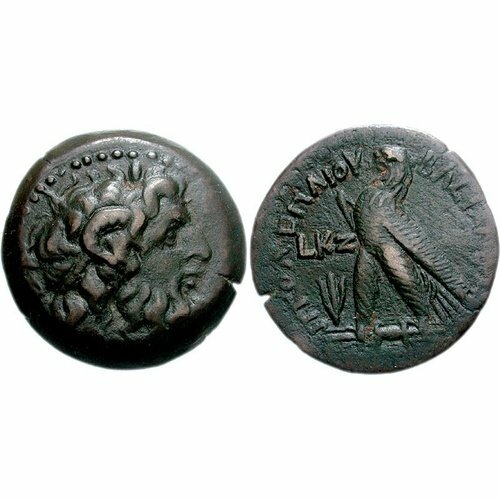 7: Bronze coin from Cyprus dated to the reign of Ptolemy I after 294 BC. Paul-Francis Jacquier 38, 13 September 2013, 169 (7,46 g, 23 mm). Sv. 363. Fig. 8: Ptolemy I, bronze coin from Cyprus with Aphrodite. Gemini V, 6 January 2009, 687 (7,60 g, 20 mm). Sv. 74. Fig. 9: Ptolemy III, bronze coin from Cyprus with Aphrodite. CNG e-Auction 315, 20 November 2013, 138 (18,30 g, 28 mm, 11 h) Sv. 1005. Fig. 10: Ptolemy II (after c. 261) to III, bronze coin from Cyprus with Aphrodite. CNG e-Auction 310, 5 September 2013, 152 (8,64 g, 22 mm, 12 h). Sv. 842. Fig. 11: Bronze coin from Cyprus dated from 27th year of Ptolemy VIII=144/3. CNG 76, 12 December 2007, 916 (9,38 g, 24 mm, 12 h). Sv. 1622. Fig. 12: Bronze coin from Cyprus dated to the reign of Cleopatra VII. CNG Triton XIII, 5 January 2010, 241 (15,13 g, 27 mm, 11 h). Sv. 1874=RPC I, 3901. 1 The author wishes to thank Catharine Lorber for her careful reading of these few pages. We are also grateful to the copyright holders who granted permission for the use of their pictures. 2 Hill 1940, p. 156-172; Bagnall 1976, p. 39-42; Hölbl 2001, p. 17 et 23. On Cypriot coinages from this intricate period: Destrooper-Georgiades 2007. 3 On the creation of a closed monetary economy: Mørkholm 1991, 63-67; Le Rider 1998; Callataÿ 2005; Le Rider, Callataÿ 2006, 131-138; Lorber 2012. 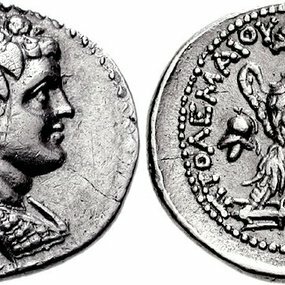 4 Poole 1883, 13-16 (Ptolemy I and Ptolemy II), 46-47 (Ptolemy III), 62 (Ptolemy IV). 5 However, the author discusses this possibility for some series in his commentary volume (vol. I), cols. 169-172. 6 Respectively Sv. 521, 522, 523=Poole 1883, 43, No 8 and Sv. 523a. 7 Davesne, Le Rider 1989, 277-284. 11 We thank C.C. Lorber for allowing us to produce the list of varieties she attributes to Cyprus before the publication of her book. Even though the author assigns new number to each variety, we judged more convenient, until the publication, to retain the old Svoronos references (= Sv.). 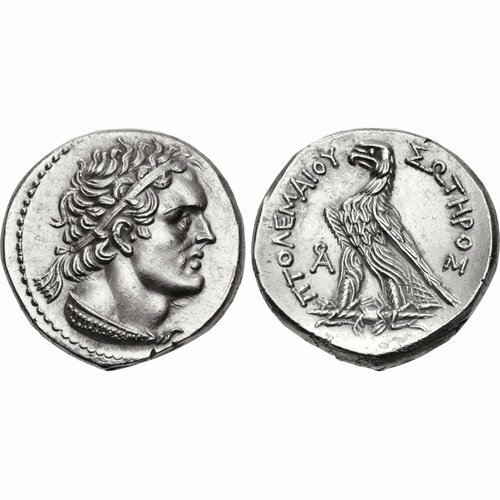 12 Lorber attributes no gold or silver coin in Cyprus under the reign of Ptolemy III and Ptolemy IV. 13 We should add the very reduced production of Amathus in 170/69 – 169/8: Poole 1883, 71, n° 37; Svoronos 1904, col 360-362; Amandry 1984, 65, 76; Mørkholm, Kromann 1984, 162; Olivier 2012, 373-374 and Olivier, Aumaître 2014. 15 Svoronos 1904, cols. 358-363. 16 Nicoalou-Mørkholm 1976; Mørkholm 1983; Mørkholm, Kromann 1984. On the emissions of gold and silver from Cyprus in the second century, see also Olivier 2012, 346-487. 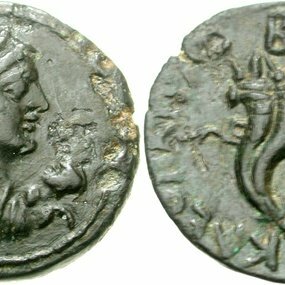 17 Poole 1883, commentary, liv; catalogue, 93, 95, 98, 105, 108, 112-114 for ΠA coins attributed to Alexandria from 146/5 to 80 B.C. 18 Svoronos 1904, col. 372 (Ptolemy VIII); col. 414 (Ptolemy IX and X). 19 Newell 1927, 23; Newell 1941, 7. 20 Mørkholm 1975, 8; Nicolaou, Mørkholm 1976, 94. 21 On this matter, see recent works: Olivier 2012, 348-356; Olivier-Keen, forthcoming. 22 Mørkholm 1975-1976, especially p. 52-57. We leave out the debate on defining the era used on these emissions. Proposals of R. A. Hazzard (resuming the hypothesis of Poole 1883, 76) relating to the identification of the Soter era (Hazzard 1975; Hazzard, Fitzgerald 1991) are now widely accepted (Lorber 1995/6, 262-263; Lorber 2007a, 105-117; Duyrat 2005, 266-272). 25 Lorber 2007(a), especially, 110-117. 26 These hypotheses are proposed and defended by Olivier in his doctoral PhD (Olivier, 2012, 386-397) and will shortly be published. 27 On these coins with an original type, see Hazzard 1998 and new proposals of Olivier 2012, 438-468. 28 Davesne, Le Rider 1989, 281-283; Lorber, forthcoming. 29 Olivier 2012, 469-487; Olivier, Faucher, forthcoming. 31 Olivier 2012, 478-484; Olivier, Keen, forthcoming. 32 Poole 1883; Svoronos 1904; Mørkholm, Kromann 1977. 34 Cox 1959; Michaelidou-Nicolaou 2007. 37 Helly 1970; Callot 2004. 40 However, Lorber 2001, 40 note that this phenomenon is noticeably less important after the introduction of the Egyptian series 3, circa 265/260. 44 On the datation: Lorber, forthcoming. The location of the mint is discussed: Paphos and Salamis (Poole 1883, 7), Paphos (Cox 1959, 95), Salamis (Helly 1970, 249; Keen 2012, 123). 46 Lorber 2007(b); Houghton et alii 2008 I, 53. 47 Hill 1940, 206-210; Will 1967, 522; Michaelidou-Nicolaou 1976, 20-24; Hölbl 2001, 226; 240-251. 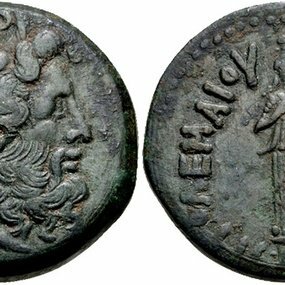 48 He recently published a metrological study dedicated to the third-century Ptolemaic bronze coins, including Cypriot issues: Wolf 2013. Amandry, M. 1984: “Le monnayage d’Amathonte”: Aupert P., Hellmann M.-C. (dir. ), Amathonte I. Testimonia I.. Études chypriotes IV, Paris, 57-76. Amandry, M. 2006: “Appendice I, Les monnaies”: Fourrier S., Hermary A., Amathonte VI. Le sanctuaire d’Aphrodite, des origines au début de l’époque impériale, Paris, 197-199. Bagnall, R.S. 1976: The administration of the Ptolemaic possessions outside Egypt, Leyden. Destrooper-Georgiades, A. 2007: “The Cypriote Coinage during the 4th Century B.C. : Unified or Chaotic Evolution in the Hellenistic Period?”, Flourentzos P. (ed. ), From Evagoras I to the Ptolemies, Nicosia, 265-281. Callataÿ, F. (de) 2005: L'instauration par Ptolémée Ier Sôter d'une économie monétaire fermée: Duyrat, F., Picard, O. (ed. ), L’exception égyptienne ? Production et échanges monétaires en Égypte hellénistique et romaine. Actes du colloque d'Alexandrie, 13-15 avril 2002, Le Caire, 117-134. Callot, O. 1993: “Les monnaies”: Salles J.F. (dir. ), Les niveaux hellénistiques, Kition – Bamboula IV, 149-164. Callot, O. 2004: Salamine de Chypre XVI. Les monnaies. Fouilles de la ville 1964-1974, Paris. Cox, D.H. 1959: Coins from the Excavations at Curium, 1932-1953, ANSMN 145, New York. Davesne, A., Le Rider G. 1989: Gülnar II. Le trésor de Meydancikkale, Paris. Duyrat, F. 2005: Arados hellénistique, étude historique et monétaire, Paris. Gitler, H., Kushnir-Stein, A. 1994-1999: “The Chronology of a Late Ptolemaic Bronze Coin-Type from Cyprus”, Israel Numismatic Journal 13, 1994-1999, 46-53. Hazzard, R.A. 1975: “The Tyre hoard of 1955: IGCH 1551”, Cornucopiae 3, 57-63. 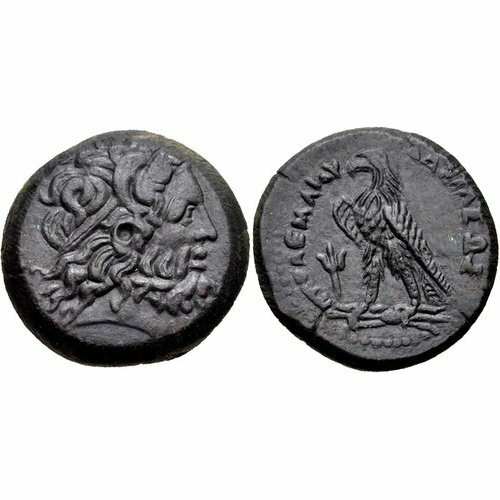 Hazzard, R.A. 1995: Ptolemaic Coins: An Introduction for Collectors, Toronto. Hazzard, R.A. 1998: “A Review of the Cyprus Hoard, 1982”, NC 158, 25-36. Hazzard, R.A., Fitzgerald M.P.V. 1991: “The regulation of the Ptolemaieia: A hypothesis explored”, Journal of the Royal Astronomical Society of Canada 85/1, 6-23. Helly, B. 1970: “Les monnaies”: Karageorghis, V., Excavations in the Necropolis of Salamis II (Salamis 4), Nicosia, 236-268. Hill, G. 1940: A History of Cyprus, volume 1: To the Conquest by Richard Lion Heart, Cambridge. Hölbl, G. 2001: A history of the Ptolemaic empire, London-New York. Houghton, A., Lorber C.C., Hoover O.D. 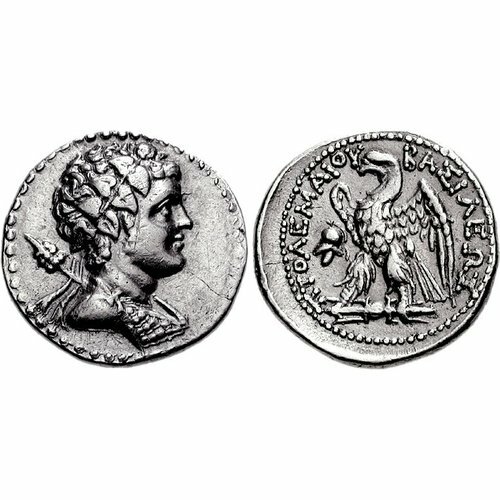 2008: Seleucid Coins. A Comprehensive Catalogue (2 vols. ), Lancaster-London. Keen, P. 2012: Land of Experiment: The Ptolemies and the Development of Hellenistic Cyprus, 312-58 BCE (doctoral dissertation, University of Chicago). Keen, P. (forthcoming), “The Iraq al-Amir Hoard: Commerce Portion” in Faucher T., Meadows A., Lorber C.C. (eds. ), Egyptian Hoards, IFAO, Cairo. Le Rider, G. 1998: “Histoire économique et monétaire de l'orient hellénistique. Le monnayage des Ptolémée”, Annuaire du Collège de France 1997-1998. Résumé des cours, Paris, 1107-1133. Le Rider, G., Callataÿ F. (de) 2006: Les Séleucides et les Ptolémées, l'héritage monétaire et financier d'Alexandre le Grand, Paris. Lorber, C.C. 1995/6: “Hazzard and Weiser, Ptolemaic coins”, AJN 7-8, 256-276. Lorber, C.C. 2001: “The Lotus of Aphrodite on Ptolemaic Bronzes”, SNR 80, 39-52. Lorber, C.C. 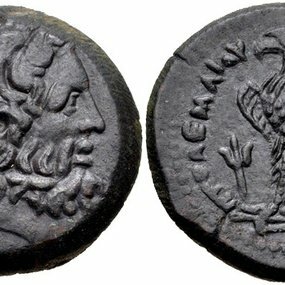 2007a: “The Ptolemaic Era Coinage Revisited”, NC 167, 105-117. Lorber, C.C. 2007b: “Ptolemaic Bronzes of Antiochus IV”, RBN CLIII, p. 31-44. Lorber, C.C. 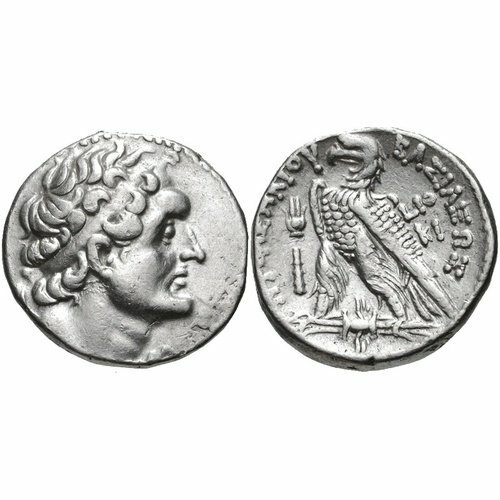 2012: “Dating the Coins of Ptolemy I”, AJN 24, 33-44. Lorber, C.C. Forthcoming: The Coinage of the Ptolemaic Empire. Maier, F.G. 2007: “From Regional Center to Sanctuary Town: Palaipaphos in the Late Classical and Early Hellenistic Period”: Flourentzos P. (ed. ), From Evagoras I to the Ptolemies, Nicosia, 17-33. Meadows, A. (forthcoming), “The 'Syria' 1981 Hoard (CH7.90; 8.306; 8.332; 8.344)” in Faucher T., Meadows A., Lorber C.C. (eds. ), Egyptian Hoards, IFAO, Cairo. Michaelidou-Nicolaou, I. 1976: Prosopography of Ptolemaic Cyprus, Goteborg. Michaelidou-Nicolaou, I. 2007: “The Coins”: Megaw A.H.S. (dir. ), Kourion. Excavations in the Episcopal Precinct, Washington,393-425. Mørkholm, O. 1975: “Ptolemaic coins and chronology”, ANSMN 20, 7-24. Mørkholm, O. 1975-1976: “The Ptolemaic Coins of an Uncertain Era”, Nordisk Numismatik Arsskrift, 23-58. Mørkholm, O. 1983: “The last Ptolemaic Silver Coinage in Cyprus”, Chiron 13, 69-79. Mørkholm, O. 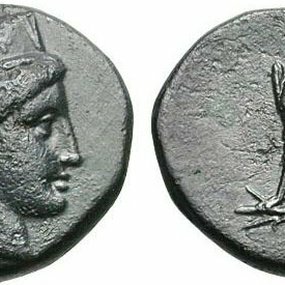 1991: Early Hellenistic Coinage, from the accession of Alexander to the Peace of Apamea (336-188 B.C. ), Cambridge. Mørkholm, O., Kromann A. 1977: Sylloge Nummorum Graecorum. The Royal Collection of Coins and Medals, Danish National Museum. Egypt: The Ptolemies, Copenhagen. Mørkholm, O., Kromann A 1984: “The Ptolemaic Silver Coinage in Cyprus 192/1-164/3 B.C.”, Chiron 14, 149-173. Newell, E.T. 1927: “Two Recent Egyptian Hoards”, NNM 33, New York, 1927, 14-31. Newell, E.T. 1941: Standard Ptolemaic Silver, New York. Nicolaou, I. 1990: Paphos II. The Coins from the House of Dionysos, Nicosia. Nicolaou, I., Mørkholm O. 1976: Paphos, 1: A Ptolemaic Coin Hoard, Nicosia. Olivier, J. 2012: Archè et Chrémata en Égypte au IIe siècle avant J.-C. (204-81 av. J.-C.). Étude de numismatique et d’histoire (doctoral dissertation, University of Orléans). Olivier, J., Aumaître H. 2014: “L’atelier monétaire d’Amathonte et la sixième guerre de Syrie (170/69 – 169/8) ”, BSFN year 69, No 2 (February), 26-36. Olivier, J., Faucher, T. forthcoming: “Le trésor de Paphos (IGCH 1477 ; CH 2.106 ; CH 4.68)”: Faucher T., Meadows A., Lorber C.C. (éds. ), Egyptian Hoards, IFAO, Cairo. Olivier, J., Keen, P. forthcoming: “Nea Paphos as Ptolemaic Mint and Administrative Center”: Balandier C., Raptou E., Actes du colloque international Nea Paphos, fondation et développement urbanistique d’une ville chypriote de l’antiquité à nos jours., 30-31 octobre 2012, Université d’Avignon. Picard, O., Faucher, T. 2012 : “Les monnaies lagides”: Picard O., Bresc C., Faucher, T., Gorre G., Marcellesi, M.-C., Morrisson C., Les monnaies des fouilles du Centre d’Études Alexandrines, Les monnayages de bronze à Alexandrie de la conquête d’Alexandre à l’Égypte moderne, Etudes alexandrines 25, 17-108. Poole, R.S. 1883: Catalogue of Greeks Coins of British Museum: the Ptolemies, Kings of Egypt, London. Svoronos, J.N. 1904: Τα νομίσματα του κράτους των Πτολεμαίων, Athens. Will, E. 1967: Histoire politique du monde hellénistique (323-30 av. J.-C.), II, Nancy. Wolf, D. 2013: “A Metrological Survey of Ptolemaic Bronze Coins”, AJN 25, 49-118.